Tickets can be purchased at our ticket office at 57 Beach Road, Lake George, NY. Tickets can also be purchased online or by calling our ticket office at 518-668-5777 x4. We charge your credit card at the time the reservation is made. We accept Visa, MasterCard and Discover credit cards online, over the phone and at the ticket office. We accept cash and travelers checks only at the ticket office. We do not accept personal checks. Do I need a reservation? How far in advance should I make a reservation? Reservations are recommended for the Mohican Family Dinner Cruises, Saint Sacrement Buffet Cruises, Fireworks Cruises, Minne “Rock the Dock” Cruises and other Specialty Event Cruises. Many of these cruises do sell out. For sightseeing only cruises it is not necessary to make a reservation but you are welcome to do so. If I purchase tickets online or over the phone, how do I pick up the tickets? Am I able to board the boat with the confirmation page only? We hold the tickets at our ticket office for you. You will need to pick up the actual boat tickets to board the boat. If you purchased tickets online or over the phone you will be asked to present picture ID and the credit card you used for the purchase when you are at the ticket office. Do you have Senior / Child Rates or offer discounts? Yes. We have a senior rate for those 65 and older. We offer a discount to all AAA card holders and active/inactive military personnel with I.D. Our child rate applies to children aged 4-11. 3 and under are free. For information on discounts for groups of 20 or more, please call 518-668-5777 x205. We have coupons in many directories throughout the area. Coupons and other discounts are not applied to your purchase online or over the phone. When you come to the ticket office to pick up your tickets, the coupon, if applicable, will be applied and the discount refunded. The coupons are cruise and time specific, please do read them carefully. No cancellations, changes or transfers will be accepted within 72 hours of the cruise. Prior to that, any cancellations, changes or transfers will incur a fee. $10 fee for reservations on the Minne Ha Ha or Mohican. $25 fee for reservations on the Saint Sacrement. $30 fee for reservations for any specialty cruise. There are no refunds for no-shows or late arrivals. The Lunch, Brunch and Dinner Buffet tickets for the Lac du Saint Sacrement include all taxes and a small gratuity. Of course, you are welcome to tip staff members more for excellent service. Is it possible to purchase a gift certificate for a friend/relative? Yes, Gift Certificates are available for purchase. Gift Certificates can be purchased in a specific dollar amount to be applied to a cruise of the recipients’ choice or for a specific number of people on a specific cruise. To purchase a Gift Certificate, please contact our ticket office at 518-668-5777 x 4. Yes. Each boat is accessible by ramp. The Minne Ha Ha and the Lac du saint Sacrement both have lifts to the upper decks. The lift accommodates standard sized wheelchairs. If you have another type of wheelchair or mobility aid, please contact our office to check the lift weight and size capabilities. The Mohican is 1st deck accessible only. Do the boats go out if it is raining? Yes. We sail rain or shine. 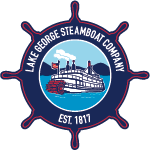 If for any reason the Lake George Steamboat Company cancels a trip, we will offer you a full refund or reschedule your trip. If the weather is not ideal and you choose on your own not to sail, there will be no refund or rescheduling. Are the boats air conditioned/heated? The Minne Ha Ha and Mohican are not air conditioned. The Lac du Saint Sacrement is air conditioned and heated in the dining room areas only. Is seating on the boats reserved? Seating is reserved on the Lac du Saint Sacrement Cruises if you have purchased the cruise with buffet. The indoor and outdoor seating on all other cruises is on a first come, first served basis and you select your seat(s) after you board. What is the difference between a Sightseeing Cruise and a Buffet Cruise on the Lac du saint Sacrement? A Sightseeing Cruise provides a two hour trip on the outer decks of the Lac du Saint Sacrement. Sightseeing passengers can enjoy a casual meal or drink(s) from our Port of Call Snack Bar and Lounge on the third deck. A Buffet Cruise includes either lunch, brunch or dinner. After the buffet is over, passengers may remain at their tables or roam to the outer decks. Sightseeing passengers are welcome to enter the dining room for entertainment and dancing after the buffet service has ended. Is there entertainment on the cruises? The Midday Luncheon and Sunset Dinner Cruises aboard the Lac du Saint Sacrement include musician Danny Lombardo. The Minne Ha Ha “Rock the Dock” Cruises have a variety of bands on their scheduled cruises. All cruises provide live narration from our Captains. Can we bring a stroller on the boat? Strollers are allowed everywhere except the dining rooms on the Saint Sacrement. There are lifts on the Saint Sacrement and the Minne Ha Ha, but these are for wheelchairs, not strollers. Are dogs allowed on the boats? Service Dogs are allowed on the boats. The American Disabilities Act (ADA) defines a service animal as any guide dog, signal dog, or another dog individually trained to work or perform tasks for an individual with a disability, who if asked, must be able to describe the specific task performed or work done by the animal. The work done or tasks performed by the service animal must be directly related to the handler’s disability. One’s disability may not be apparent (e.g. seizure disorder). A “comfort”, “emotional support” or “therapy animal” that provides support simply by being itself does NOT meet the definition of a service animal. If the animal is not individually trained to do work or perform a task, it is considered a pet under the ADA. Other small dogs are allowed on the boats BUT they MUST be in a handheld, approved mesh pet carrier which fastens closed. They MUST REMAIN in the carrier for the duration of cruise. They are not allowed in the dining areas. We do not allow any other animals on the boats. No, but we do adhere to the “No Shoes, No Shirt, No Service” rule. On the Lac du Saint Sacrement and Mohican meal cruises, most passengers dress “resort casual”. We do recommend a light jacket or coat for the outer decks, and flat heeled shoes for walking safely around the boat. If you are attending a party on the boat sponsored by an individual or corporation, please check with your host for attire appropriate to their function. Is smoking/vaping allowed on your boats? The Minne Ha Ha is completely smoke-free. On the Lac du Saint Sacrement and on the Mohican, there are designated areas on the outer decks for smoking/vaping. Smoking/Vaping is not permitted while waiting in the boarding line or near the ticket office. Please be courteous to other passengers and comply with this request. Can we bring our own food or drink onto the boats? No outside food, beverages or coolers are allowed to be brought onto the boats. We have cocktail bars and a snack bar on each boat. Exceptions are made for passengers with special dietary needs to include food allergies and baby food/formula. Passengers with special dietary needs should contact us at 518-668-5777 x4 to discuss their needs. Can I carry on a backpack or large bag? You may, but the Ship’s Officers have authority to examine all items brought aboard this vessel. Yes. We have a parking lot behind our gift shop, across the street from the Steel Pier. We do charge a fee. We provide handicap parking directly on the Steel Pier for the duration of the cruise only. We do charge a minimal fee. We recommend a minimum of 30-45 minutes prior to departure in order to secure parking, pick up your cruise tickets and board. Some of our cruises board 15 minutes in advance of sailing, some 30 minutes, and the Lac du Saint Sacrement Buffet Cruises begin boarding 1 hour prior to sailing. During high volume event weekends (car shows, wine & food festivals, etc) and on fireworks evenings, we recommend you allow extra time on top of the suggested times above. We do not give refunds for late arrivals/missed cruises. Where can I purchase Steamboat Souvenirs? Our Steamboat Store is located directly across the street from the Steel Pier and there are Gift Shops aboard each of the boats. How do I get a copy of the photo that was taken when I boarded the boat?